Rochester, New York, Memorial Art Gallery, American Print Makers, January 1930, no. 191. Cincinnati, Ohio, Cincinnati Art Museum, The Thirty-Seventh Annual Exhibition of American Art, June 1-29, 1930, no. 45, pl. 45, illustrated. St. Louis, Missouri, City Art Museum, Twenty-Fifth Annual Exhibition of Paintings by American Artists, September 20-November 2, 1930, p. 25, no. 52, illustrated. Chicago, Illinois, Art Institute of Chicago, The Forty-Third Annual Exhibition of American Paintings and Sculpture, October 30-December 14, 1930, no. 84. Philadelphia, Pennsylvania, Pennsylvania Academy of the Fine Arts, 126th Annual Exhibition, January 25-March 15, 1931, p. 13, no. 229, illustrated. Pittsburgh, Pennsylvania, Carnegie Institute, An Exhibition of Modern American Paintings, April 28-May 30, 1932, no. 26. Lincoln, Nebraska, Nebraska Art Association, University of Nebraska, Forty-Third Annual Exhibition of Paintings, February 16-March 19, 1933. Springfield, Massachusetts, The Springfield Museum of Fine Arts, Opening Exhibition, October 7-November 2, 1933, no. 194. Kansas City, Missouri, The William Rockhill Nelson Gallery of Art, A Loan Exhibition of American Paintings Since 1900, December 10, 1933-January 4, 1934. Ottawa, Canada, National Gallery of Canada, Exhibition of Contemporary Paintings by Artists of the United States, December 7-31, 1934, p. 12, no. 46, illustrated. Pittsburgh, Pennsylvania, Carnegie Institute, An Exhibition of Paintings, Watercolors, and Etchings by Edward Hopper, March 11-April 25, 1937, no. 15. Chicago, Illinois, Art Institute of Chicago, The Fifty-Fourth Annual Exhibition of American Paintings and Sculpture, October 28-December 12, 1943, no. 1. New York, The American Academy of Arts and Letters & The National Institute of Arts and Letters, Works by Newly Elected Members and Recipients of 'Arts and Letters Grants,' May 19-June 29, 1945, no. 2. New York, Whitney Museum of American Art; Boston, Massachusetts, Museum of Fine Arts; Detroit, Michigan, The Detroit Institute, Edward Hopper, February 11-July 2, 1950, pp. 15, 55, no. 32, pl. 9, illustrated. New York, Whitney Museum of American Art; Chicago, Illinois, Art Institute of Chicago; Detroit, Michigan, Detroit Institute of Arts; St. Louis, Missouri, City Art Museum, Edward Hopper, September 29, 1964-May 9, 1965, pp. 20, 65, no. 18, illustrated. West Palm Beach, Florida, Norton Museum of Art, Palm Beach Collects, May 11-October 1970. Philadelphia, Pennsylvania, Pennsylvania Academy of the Fine Arts, Edward Hopper Retrospective, September 24-October 31, 1971, no. 95. New York, Whitney Museum of American Art; Amsterdam, Netherlands, Stedelijk Museum; Dusseldorf, Germany, Städtische Kunsthalle; Chicago, Illinois, Art Institute of Chicago; San Francisco, California, San Francisco Museum of Modern Art, Edward Hopper: The Art and the Artist, September 16, 1980-February 14, 1982, pp. 52, 235, pl. 328, illustrated. London, Hayward Gallery, Edward Hopper, 1882-1967, February 11-March 29, 1981, pp. 23, 42, no. 72. St. Louis, Missouri, St. Louis Art Museum; Honolulu, Hawaii, Honolulu Academy of Arts; Boston, Massachusetts, Museum of Fine Arts, The Ebsworth Collection: American Modernism, 1911-1947, November 20, 1987-June 5, 1988, pp. 14, 28-30, 110-11, 208-09, no. 33, illustrated. Washington, D.C., National Museum of American Art, Smithsonian Institution, American Impressions: Masterworks from American Art Forum Collections, March 27-July 5, 1993, pp. 10-11, no. 13, illustrated. New York, Whitney Museum of American Art, Edward Hopper and the American Imagination, June 22-October 15, 1995, pl. 21, illustrated. Seattle, Washington, Seattle Art Museum, Seattle Collects Paintings: Works from Private Collections, May 22-September 7, 1997. New York, Whitney Museum of American Art, The American Century: Art and Culture, 1900-2000, April 23-August 22, 1999, p. 181, no. 340, illustrated. Washington, D.C., National Gallery of Art; Seattle, Washington, Seattle Art Museum, Twentieth-Century American Art: The Ebsworth Collection, March 5-November 12, 2000, pp. 22, 33, 136-39, no. 30, illustrated. Boston, Massachusetts, Museum of Fine Arts; Washington, D.C., National Gallery of Art; Chicago, Illinois, Art Institute of Chicago, Edward Hopper, May 6, 2007-May 11, 2008, pp. 20, 184-85, no. 101, cover illustration. Seattle, Washington, Seattle Art Museum, Edward Hopper's Women, November 13, 2008-March 1, 2009, pp. 6, 33-39, 42, no. 7, cover illustration. Des Moines, Iowa, Des Moines Art Center, Edward Hopper: Images & Influence, December 18, 2009-April 23, 2010. Paris, France, Grand Palais, Hopper, October 10, 2012-January 28, 2013, pp. 196-97, 328, no. 125, illustrated. Artist's Record Book I, p. 57. 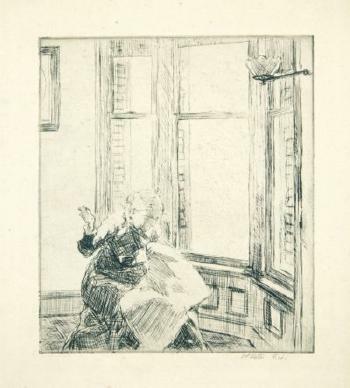 G. Pène du Bois, Edward Hopper: American Artist Series, New York, 1931, p. 27, illustrated. J.C. Bulliet, Art Masterpieces: In a Century of Progress Fine Arts Exhibition at the Art Institute of Chicago, exhibition catalogue, Chicago, Illinois, 1933, n.p. J.C. Bulliet, J. MacDonald, Paintings: An Introduction to Art, New York, 1934, n.p. "Edward Hopper--Painter and Graver," Index of Twentieth Century Artists, vol. 1, no. 5, July 1934, p. 159. "Artist Edward Hopper Tells Story of 'Room in New York,'" Lincoln Journal & Star, March 29, 1936, section C-D, p. 7. E. Brace, "Edward Hopper," Magazine of Art, vol. 30, no. 5, May 1937, p. 278, illustrated. "This is America," Chicago Daily News, October 30, 1943, p. 2, illustrated. L. Goodrich, Edward Hopper, New York, 1949, pl. 9, illustrated. C. Burrows, "Hopper: A Steady Climb to Eminence," The New York Herald Tribune, February 12, 1950, section 5, p. 6, illustrated. M. Breuning, "The Whitney Hails Edward Hopper," The Art Digest, February 15, 1950, p. 10. R.M. Coates, "The Art Galleries: Edward Hopper," The New Yorker, February 25, 1950, pp. 77-78. J.T. Soby, "Arrested Time by Edward Hopper," The Saturday Review, March 4, 1950, pp. 42-43. "Edward Hopper: Famous American Realist Has Retrospective Show," Life, April 17, 1950, pp. 100-05, illustrated. S. Burrey, "Edward Hopper: The Emptying Spaces," The Art Digest, April 1, 1955, p. 10. L. Cooke, "Paintings by Edward Hopper," America Illustrated, July 23, 1958, pp. 56-65, illustrated. S. Tillim, "Edward Hopper and the Provincial Principle," Arts Magazine, vol. 39, November 1964, pp. 26, 28, illustrated. L. Bruner, "Pierre Bonnard and Edward Hopper: Two Painters with a Point of View," Toledo Blade, January 17, 1965, section E, p. 4, illustrated. L. Goodrich, Edward Hopper, New York, 1971, p. 208, illustrated. J.R. Mellow, "Painter of the City," Dialogue Magazine, vol. 4, 1971, p. 76, illustrated. G. Levin, Edward Hopper: As Illustrator, New York, 1979, pp. 44, 50, fig. 58, illustrated. J.W. McRoberts, "The Conservative Realists' Image of America in the 1920s: Modernism, Traditionalism and Nationalism," Ph.D. dissertation, University of Illinois at Urbana-Champaign, 1980, p. 83n2. R. Soyer, "'Edward Hopper as Illustrator' by Gail Levin, 'Edward Hopper: The Complete Prints' by Gail Levin,” New Republic, January 12, 1980, p. 35. A. Kazin, "Hopper's Vision of New York," New York Times Magazine, September 7, 1980, p. 54. D. Grant, "Edward Hopper's Dark Vision of America," Newsday, September 28, 1980, p. 15, illustrated. G. Levin, "Edward Hopper: The Art and Artist," U.S.A. Today, November 1980, p. 35, illustrated. R. Giachetti, "Tutta l'America di Edward Hopper," Epoch, November 8, 1980, p. 79, illustrated. M. Ronnen, "Two Great Americans," Jerusalem Post Magazine, November 14, 1980, section N, n.p., illustrated. R. Paulson, "Edward Hopper and Some Precursors," Bennington Review, December 1980, p. 67. The Art Institute of Chicago: September through December, 1981, Chicago, Illinois, 1981, cover illustration. E. Siciliano, "La pittura american ha un papa: Hopper," Corriere della Sera, January 24, 1981, p. 14, illustrated. R. Elovich, "Current and Forthcoming Exhibitions," The Burlington Magazine, vol. 123, February 1981, p. 111, fig. 54, illustrated. E. Frank, "Edward Hopper: Symbolist in a Hardboiled World," Art News, vol. 80, February 1981, pp. 101-02, illustrated. W. Feaver, "The Painter of Lonely Streets and Heartbreak Hotels," London Observer, February 1, 1981, pp. 31, 35, illustrated. J. Russell, "American Light Show," The Times Magazine, February 1, 1981, p. 41, illustrated. M. Shepherd, "Light on America," The Telegraph, February 15, 1981, p. 17, illustrated. W. Packer, "Edward Hopper," London Financial Times, February 17, 1981, p. 15, illustrated. J. Exner, "Komik und Tragik der Zeit," Der Berlin Tagesspiegei, February 28, 1981, p. 4, illustrated. M.H. Young, "Edward Hopper: The Ultimate Realist," Apollo, vol. 112, March 1981, pp. 185-89, fig. 3, illustrated. C. Neve, "Early Sunday Morning," Country Life, March 12, 1981, pp. 648-50, fig. 6, illustrated. P. Allara, "Books," Tufts Criterion, vol. 13, July 1981, p. 18, illustrated. A. Pohlen, "Der Mythos vom Maler des kleinbürgerlichen Amerika," General Anzeiger, July 14, 1981, p. 9. R. Hoghe, "Menschen auf Distanz," Die Zeit, July 17, 1981, p. 35. W. Su, "Einsame Akteure in Edward Hoppers Licht-Schatten-Theater," Siegener Zeitung, August 4, 1981, p. 2, illustrated. J. De Roey, "Het geheim van Hopper: licht en blauw en wit," Knack, August 19, 1981, p. 96. D. Elliot, "Edward Hopper's Art--What Is that Feeling?," Chicago Sun-Times, September 17, 1981, p. 6, illustrated. F. De Vitis, "Edward Hopper: Il pittore e la solitudine," Ciao 2001, November 25, 1981, p. 17, illustrated. A. Temko, "The Private Sorrow of Edward Hopper," San Francisco Chronicle, December 20, 1981, p. 14. S. Muchnic, "American Saga of Still Lifes, Stilled Lives," Los Angeles Times, January 10, 1982, p. 79. J. Tallmer, "The Roots of 'Heaven,'" New York Post, January 14, 1982, p. 26. "Hopper: Full of Emptiness," Living California, January 17, 1982, p. 15, illustrated. G. Levin, Edward Hopper, New York, 1984, p. 45, illustrated. R. Hobbs, Edward Hopper, New York, 1987, p. 48. H. Liesbrock, Edward Hopper: Vierzig Meisterwerke, Munich, Germany, 1988, p. 17, no. 11, illustrated. K.A. Marling, Edward Hopper, New York, 1992, no. 5, cover illustration. G. Glueck, New York: The Painted City, Layton, Utah, 1992, pp. 40-41, illustrated. A. Waters, “’Chop Suey’ 1919 by Edward Hopper,” NetworkS, vol. 3. no. 2, 1992, pp. 28-29, illustrated. "The Authority of the Past," Time Magazine, February 3, 1992, p. 47, illustrated. National Museum of American Art and its Renwick Gallery: March-April 1993, Washington, D.C., 1993, p. 1, illustrated. J.A. Lewis, "Delightful Impressions: Connoisseurs Spread a Feast for the Eyes at NMAA," The Washington Post, March, 27, 1993, p. G1, G9, illustrated. M. Constantino, Edward Hopper, Greenwich, Connecticut, 1995, pp. 54-55, illustrated. J. Greenberg, The American Eye: Eleven Artists of the Twentieth Century, New York, 1995, pp. 27-28, 113, illustrated. G. Levin, Edward Hopper: A Catalogue Raisonné, vol. III, New York, 1995, pp. 190-91, no. O-265, illustrated. G. Levin, Edward Hopper: An Intimate Biography, New York, 1995, pp. 172, 221, 285, 699, 773, fig. 40, illustrated. G. Levin, Edward Hopper, New York, 1995, pp. 41, 45, illustrated. G. Levin, The Poetry of Solitude: A Tribute to Edward Hopper, New York, 1995, pp. 56-57, 80, illustrated. R. Perez, The Lining of Our Souls, New York, 1995, p. 21. “Un regista per l’America,” Arte, June 1995, pp. 3, 52. M. Kakutani, “In Prose and in Verse, Stark Paens to Hopper,” The New York Times, June 20, 1995, p. B2. J. Updike, “Edward Hopper’s Polluted Silence,” The New York Review of Books, August 10, 1995, p. 20, illustrated. C.F. Shepley, “The American Scene, with Meaning,” St. Louis Post-Dispatch, September 3, 1995. G. Levin, “Edward Hopper: Through the Biographer's Lens,” Art Times, September 12, 1995, p. 12, illustrated. G. Mori, “Metafisica Americana,” Art Dossier, no. 104, September 1995, pp. 6-7, illustrated. R. Coles, "Alone in America," The Washington Post, October 15, 1995, p. 11. The Art of Drawing and Painting, London, 1996, n.p., illustrated. J. Cartwright, “How Art Mirrors American Life,” London Financial Times, October 25-26, 1997, p. VI, illustrated. D. Anfam, Mark Rothko, The Works on Canvas: Catalogue Raisonné, New Haven, Connecticut, 1998, pp. 27, 41n19, fig. 35, illustrated. J. Spring, The Essential Edward Hopper, New York, 1998, pp. 4, 5, 13, 76, illustrated. V.M. Mecklenburg, Edward Hopper: The Watercolors, New York, 1999, p. 158. "More than 'Chop Suey'," ARTnews, May 1999, p. 84, illustrated. P. Plagens, "Millenial Biennial," Newsweek, May 3, 1999, pp. 68-69, illustrated. G. Trebay, "Made in the U.S.A.," Travel and Leisure, April 1999, pp. 193, 195, illustrated. J.A. Lewis, "The Century Distilled," St. Louis Post-Dispatch, August 11, 1999, p. E1, E6, illustrated. J. Evans, "Chop Suey Has Been Popular for Decades," St. Louis Post-Dispatch, May 6, 2000, p. 29L, illustrated. G. Levin, The Complete Oil Paintings of Edward Hopper, New York, 2001, pp. 190-91, no. O-265, illustrated. J. Abramson, "Hopper's Sunshine," The New York Times, September 1, 2001, p. B4. T. Barrett, Interpreting Art: Reflecting, Wondering, and Responding, New York, 2002, pp. 163-64, no. 19, illustrated. Ivo Kranzfelder, Edward Hopper: Vision of Reality, Cologne, Germany, 2002, p. 155, illustrated. "Of Men and Machines," Museums and Galleries: New York, London, 2002, p. 31, illustrated. R.G. Renner, Edward Hopper, 1882-1967: Att Transformera Det Verkliga, Cologne, Germany, 2002, pp. 67-69, 71, illustrated. L. Hawksley, Mini History of Art, Bath, England, 2002, p. 244, illustrated. M. Venezia, Grandma Moses, New York, 2003, p. 26, illustrated. A. Berman, Edward Hopper's New York, San Francisco, California, 2005, pp. 68-69, illustrated. B. Weber, Paintings of New York, 1800-1950, Petaluma, California, 2005, pp. 90, 124, illustrated. 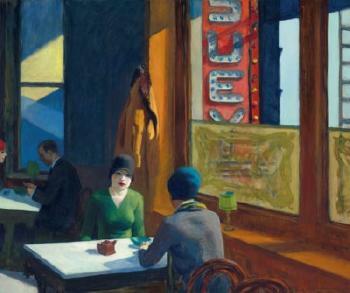 "New York in Hopper's Eyes," The New York Times, March 27, 2005, pp. 1, 7, front page illustration. J. Appel, A. Guglielmo, Feed Matisse's Fish, New York, 2006, p. 1943, illustrated. D. Ngo, ed., Art + Architecture: The Ebsworth Collection + Residence, San Francisco, California, 2006, n.p., illustrated. S. Davidson, ed., Art in America: Three Hundred Years of Innovation, exhibition catalogue, New York, 2007, fig. 87, illustrated. W. Wells, Silent Theater: The Art of Edward Hopper, New York, 2007, pp. 41-42, 44, 134, 159, 235, fig. 26, illustrated. The Magazine Antiques, April 2007, cover illustration. "What's On," The Art Newspaper, no. 180, May 2007, p. 83, illustrated. Where Magazine, November 2007, cover illustration. A. Berman, "Hopper," Smithsonian, July 2008, p. 63, illustrated. M.F. Kohl, K. Solga, Great American Artists for Kids, Chicago, Illinois, 2008, p. 34, illustrated. S. Farr, "'Hopper's Women' Captures Unguarded Moments," The Seattle Times, November 14, 2008, p. 1,41, illustrated. A. Coe, Chop Suey: A Cultural History of Chinese Food in the United States, New York, 2009, pp. 197-98. C.E. Foster, Edward Hopper, exhibition catalogue, Milan, Italy, 2010, pp. 46, 48-49, fig. 17, illustrated. G. Young, Stir-Frying to the Sky's Edge: The Ultimate Guide to Mastery, with Authentic Recipes and Stories, New York, 2010, pp. xiii, 236, illustrated. M. Knoedler & Co., Inc., Milton Avery: Industrial Revelations, exhibition catalogue, New York, 2010, p. 12, illustrated. C.W. Sargent, "Note to New Yorkers: We Also Have a Claim as a Hopper Inspiration," Portland Monthly, September 2010, illustrated. P. Rhode, et al., Economic Evolution and Revolution in Historical Time, Stanford, California, 2011, p. 420. B. Ebsworth, A World of Possibility: An Autobiography, Hunts Point, Washington, 2012, pp. 161-63. D. Lyons, B. O'Doherty, Edward Hopper: Paintings & Ledger Book Drawings, New York, 2012, p. 17. G. Souter, Edward Hopper: Light and Dark, New York, 2012, pp. 125, 154-55, illustrated. C.E. Foster, et al., Hopper Drawing, exhibition catalogue, New York, 2013, p. 46. C. Parravani, Her: A Memoir, New York, 2013, p. 141. N.K. Anderson, C. Brock, Andrew Wyeth: Looking Out, Looking In, exhibition catalogue, Washington, D.C., 2014, p. 59, fig. 22, illustrated. A.F. Smith, ed., Savoring Gotham: A Food Lover's Companion to New York City, New York, 2015, n.p. H. Liu, From Canton Restaurant to Panda Express: A History of Chinese Food in the United States, New Brunswick, New Jersey, 2015, pp. 59-60, 83, 170n44. The artist. [With]Frank K.M. Rehn Gallery, New York. Mr. and Mrs. Mark Reed, Alexandria, Virginia, acquired from the above, 1950. [With]Frank K.M. Rehn Gallery, New York. Mr. and Mrs. Louis Cohen, Great Neck, New York, acquired from the above, 1968. [With]William Zierler, Inc., New York, 1972. Acquired by the late owner from the above, 1973.